Synopsis: Walter Parrish, a conventional if somewhat priggish middle-class boy of fifteen, is dispatched to spend the summer with his aunt and uncle because his parents are having some marital difficulties. He soon becomes integrated into the life of a decaying Kentish fruit farm and its three denizens: Uncle Patrick, Aunt Leonie and Leonie’s highly intelligent dog, Remus. Patrick is an invalid and as Leonie is both attractive and a lot younger than her partner, Walter is soon smitten by her. When he learns that his aunt and uncle are not in fact married, Walter plans to win Leonie from Patrick. However, he has reckoned without the capriciousness of Leonie and the prior claims of Colonel Masters, a neighbouring farmer who is convinced that Remus has been chasing his sheep. Context: Balchin said that Seen Dimly Before Dawn “originated in an actual incident in 1948”. This may have been the “sheep-worrying” episode although, if so, Balchin must have been slightly confused about the year because that event took place in company with his second wife Yovanka, and he didn’t meet her until 1949. The book was written in Florence in the spring of 1961. 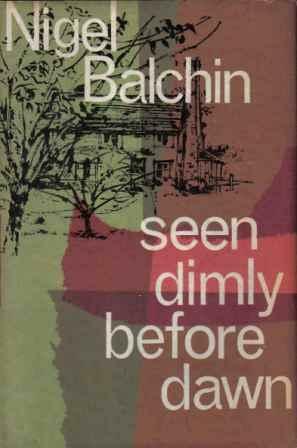 Verdict: Like The Fall of the Sparrow, its immediate predecessor, Seen Dimly Before Dawn is one of the most enjoyable and intensely readable of all Balchin’s novels. It is also very different from most of his other novels, largely because the world of work barely features at all. The unresolved ending is slightly unsatisfactory in my opinion, and the book might have been strengthened had an epilogue been appended in which the narrator had reflected on these events in later life and examined (with the benefit of hindsight) what ramifications they had had for the protagonists. Availability: It sold quite well so second-hand copies should be fairly easy to come by.